Conor Washington of Peterborough United in action with Oliver Lee of Luton Town in December 2015. Posh have been drawn away to Luton Town in the third round of the Checkatrade Trophy. Tha game is scheduled to take place the week commencing 8th January 2018. League Two Luton beat West Ham Under 21s 4-0 in the second round while Posh were seeing off Southend 2-0. The last time Posh played Luton was in an FA Cup tie at London Road in December 2015. 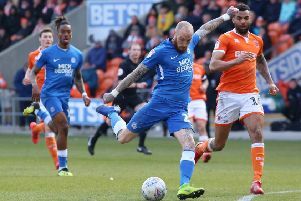 Posh won 2-0 with goals by Conor Washington and Marcus Maddison. Southern Section - Yeovil Town v Forest Green Rovers, Chelsea Under 21s v Portsmouth, Charlton Athletic v oxford United, Luton Town v Peterborough United. Northern Section - Oldham Athletic v Leciester City Under 21s, Rochdale v Lincoln City, Bury v Fleetwood Town, Shrewsbury Town v Blackpool.